In our practice, pleural drainage is most often requested to treat parapneumonic effusions or empyema . 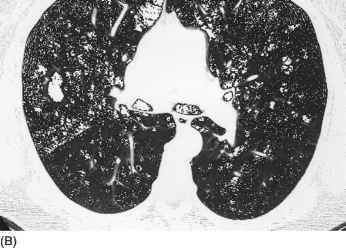 Up to 50% of patients with pneumonia have accompanying pleural fluid [25,26,27]. Most transudates or simple parapneumonic effusions respond to the antibiotic therapy. Drainage catheter placements are usually indicated for exudative effusions, either infectious, inflammatory or neoplastic. The technical approach for pleural drainage using CT fluoroscopy is similar to that for standard CT. Computed tomographic fluoroscopy is used to plan the site of access to the pleural collection for optimal drainage and patient comfort. The procedure may be performed either in real time by watching the catheter advance into the pleural fluid collection or with an interrupted real-time technique as described for percutaneous needle biopsy. We have generally used the interrupted real-time technique because it minimizes exposure to the operator's hands. Using this technique, the needle is advanced in a stepwise manner with short applications of fluoroscopic CT to document the needle/catheter path . The radiologist stays in the CT suite and initiates CT fluoroscopy via the control panel. The patient remains within the gantry during needle placement. Either a trocar or modified Seldinger technique may be used to reach the pleural collection. As a rule, large pleural fluid collections that are not adjacent to critical vascular structures may be accessed using a single stick method with a 12-14 French catheter. We typically use hydrogel-coated catheters to easily traverse fascial planes . A modified Seldinger technique is advantageous for more complex collections. In these patients, a Seldinger entry needle is placed into the thoracic collection with CT fluoroscopic guidance. A guidewire is inserted through the needle and coiled. The tract is expanded with serial dilators, after which a pigtail catheter is passed over the guidewire. Dilatation and catheter placement are performed using CT fluoroscopic observation. Documentation of catheter placement with reorientation, as necessary, is achieved with direct CT fluoro-scopic observation (Fig. 7). Complex, loculated fluid collections may necessitate multiple drainage catheters or intrapleural fibrinolytic therapy.